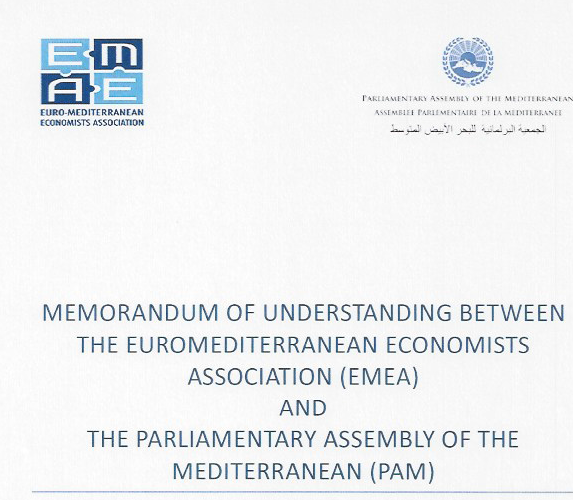 EMEA and the Parliamentary Assembly of the Mediterranean (PAM) have signed a Memorandum of Understanding (MoU), on 12 February 2015, at the EMUNI Annual Conference in Portroz, Slovenia. The Agreement was signed by PAM Secretary General, Ambassador Sergio Piazzi and EMEA President, Professor Rym Ayadi. The purpose of the MoU is to set out a framework for cooperation between EMEA and PAM. They intend to explore ways in which they can cooperate in implementing their respective mandates, including consultations, joint research and analytical studies, meetings, events, exchanges of information, and other common activities, in support of economic integration, creation of employment and social development in the Mediterranean region.